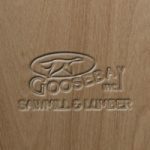 Marine Meranti Plywood - Goosebay Sawmill and Lumber, Inc.
Marine Meranti Plywood is a rotary cut BS 1088 product. It has Philippine Mahogany faces and more laminates than the AB Fir. It is a rigid plywood, has good strength, and no voids or patches. It is suitable for marine applications and boat building. Marine Plywood, like any plywood, is made up of several thin layers of veneer, or laminates. The layers of wood used in marine plywood are not treated to be rot resistant. The glues used to hold the laminates together are water proof. This means that if the plywood is exposed to dampness or water that it will be less likely to de-laminate. It is very important to tightly seal the edges of the plywood. It is expected that the plywood will be finished in its final application. Marine Meranti can be ordered in a 15mm thickness. Minimum order quantity is one sheet.